Can you star in I hate my kitchen? Do you look at your worn out old sink and get depressed? Do you wish a remodel show will find you and give you a brand new kitchen? There is no need to go through all that. A quick and easy fix to spruce up your kitchen is to replace your sink and faucet. For a sink and faucet combo there are two main styles, the apron front and the undermount sinks. 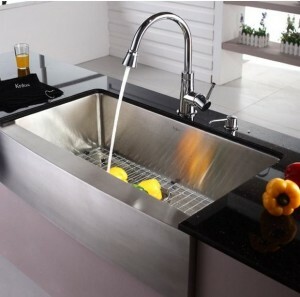 The apron sink is the new, contemporary way to modernize your kitchen. Also called farmhouse sinks, they feature a stylish stainless steel finish. Not just any stainless steel though, this sink has Stone Guard coating which reduces condensation and dampens sound, a corrosion resistant surface so it doesn’t rust or scratch, and a commercial grade satin finish with rounded corners for easy clean up. You can pick either a double sink or a deep single sink. These sinks are extra deep so no matter how big your pot it will fit. These also have top level sound proofing, so no more dishes clanging in your sink! The other part of this combo is the faucets. 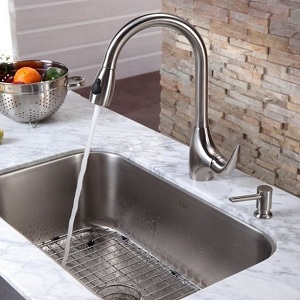 The faucets are stainless steel, with a water-efficient aerator and a precision ceramic cartridge. That means a quality product that wont drip and a large variety of faucet styles to choose from. There are 58 apron sinks to decide on so no matter what your decor there is a sink and faucet combo to match it. 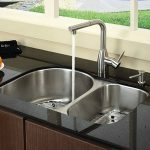 For a more traditional kitchen sink and faucet combo the undermount sink is the right choice for you. This classic design can feature different finishes like stainless steel kitchen sink combos, satin nickel, and chrome. An undermount sink can be either a double or a large single sink. 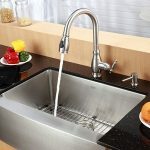 Every sink comes with a best selling stainless steel faucet. These faucets are far superior to the run of the mill faucets. These feature top quality parts that never drip and a water efficient aerator that makes for a better water pressure. There are many styles that fit which ever sink you are wanting so you are able to better plan your decor. As always Kraus products trademark sound proofing with thick rubber dampening pads and protective Stone Guard coating make them far superior to the competition. No more annoying clinking of glasses against the sink with this technology. If your kitchen needs an update, start with a quality sink and faucet combo. Whether you want a modern kitchen or a rustic design then an apron front sink and faucet combo is exactly what you are looking for. If you would like a more tradition look with an emphasis on your counter tops then an undermount sink and faucet combo is the right look for your needs. No matter what motif you are going for you can be confident with Home Art Tile kitchen and bath that you will get a quality product that you will be happy with for decades.